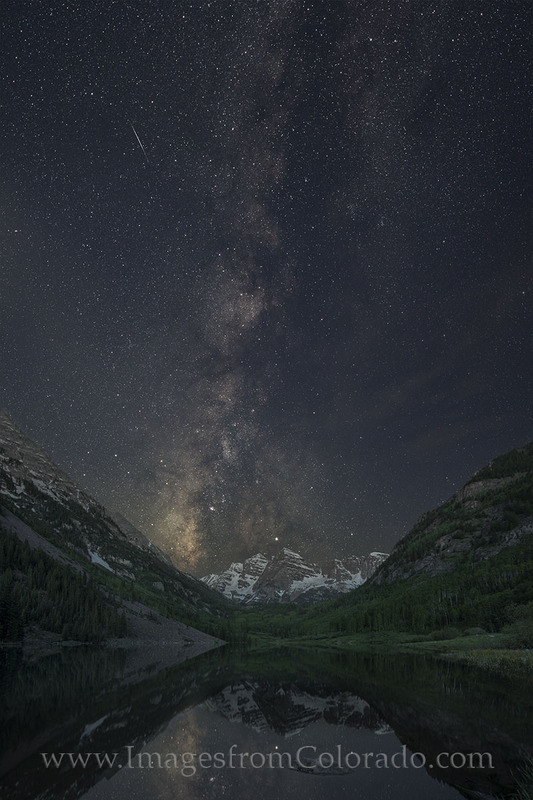 High clouds drifted by as I was photographing the Milky Way over the iconic Maroon Bells near Aspen and Snowmass, Colorado. I wasn’t sure how I’d like the finish, but I found pleasing the soft movement of these clouds. Using a star tracker, I was able to take long exposures of the night sky and blend them back into an image with the foreground of Maroon Lake and the famous 14,000’ peaks, Maroon and North Maroon. As happens quite often, it wasn’t until I returned home to process these digital files that I realized a meteor had burned across the southwestern sky as I was photographing the stars. Photo © copyright by Rob Greebon.